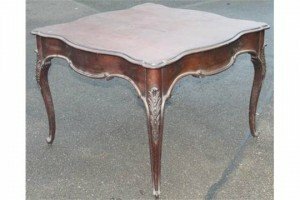 A late 19th Century mahogany occasional table, the serpentine scroll top raised on acanthus capped sabre supports terminating in scroll feet. 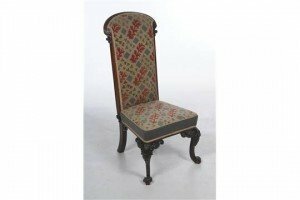 A choice William IV rosewood drawing room chair with a scrolling moulded padded back, well upholstered tapestry seat in an Persian design raised upon front leafy cabriole legs with scroll terminals. 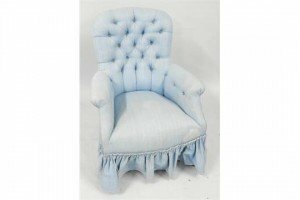 A Victorian mahogany spoon back armchair, upholstered in turquoise button back fabric, raised on turned legs on castors. 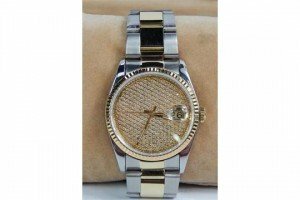 A Rolex gentleman’s date just two tone and diamond set wristwatch, circular gold dial pave set with diamonds, steel case with gold bezel and winder, two tone bracelet. 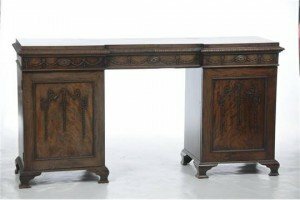 A late 19th century mahogany pedestal sideboard, the inverted breakfront with a leaf carved border above three frieze drawers, one fitted for cutlery raised upon pedestals each with panelled cupboards doors decorated with scrolls and pendant harebell’s raised upon shaped bracket feet. 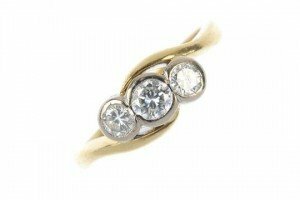 An 18 carat gold diamond three-stone ring, the three brilliant-cut diamonds, to the asymmetric curved shoulders and plain band. Total diamond weight 0.45 carat. 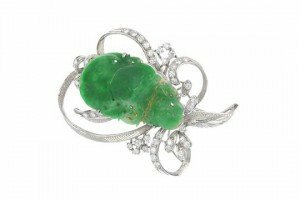 A jade and diamond brooch, the carved jadeite panel, to the openwork foliate surround, set throughout with brilliant-cut diamonds. 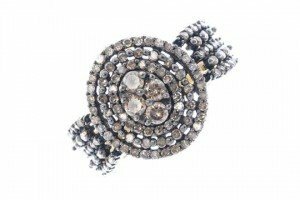 Estimated total diamond weight 1.20 carats. 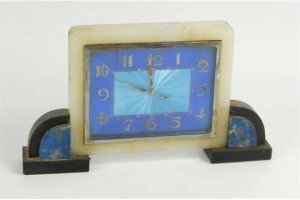 A mid 19th Century Clichy spaced millefiori glass paperweight comprising of assorted canes including white rose cane, all on solid red ground. 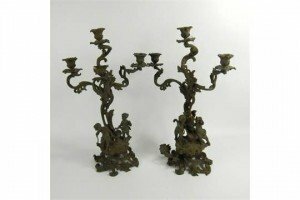 A pair of Continental gilt metal three branch candelabra, each cast in rococo style with figures on a scrolling base. 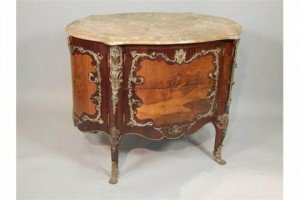 A French mahogany and marquetry double sided commode, with gilt metal mounts, the shaped top with a moulded edge above two drawers to each side and cupboard doors to each end, flanked by scroll cast, rococo scroll and leaf cast mounts, on cabriole legs with masks to the knees and paw feet. 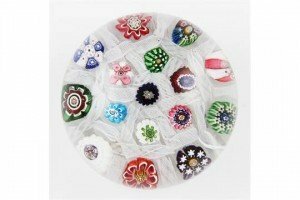 A mid 19th Century Clichy spaced chequer millefiori glass paperweight with assorted multicoloured complex canes on a latticino ground. 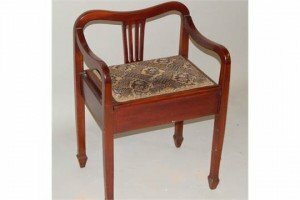 An Edwardian mahogany music seat, with moquette lift compartment, raised on square, tapering supports, on spade feet. 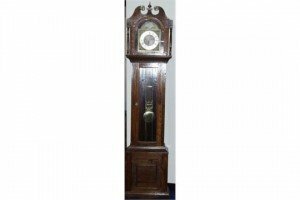 A German elm cased long case clock, the brass break arch dial with moon phase, silvered chapter ring bearing Roman numerals, three train movement with quarter strike. A 9 carat gold diamond cluster ring, the brilliant-cut diamond tiered cluster, to the pave-set diamond sides and plain band. Estimated total diamond weight 1ct. 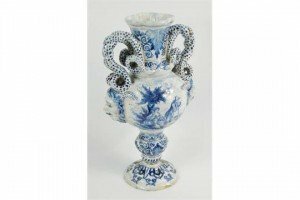 A Veuve Perrin style blue and white tin glazed earthenware vase, of twin serpent and mask handle, baluster form painted with a pastural scene and canal view with windmill. 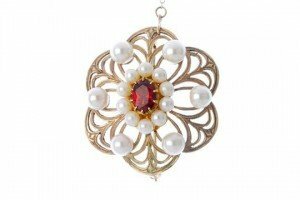 A garnet and cultured pearl brooch, the oval-shape foil-back garnet within a cultured pearl surround, to the similarly-set openwork panel. 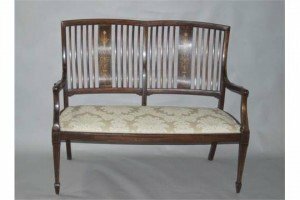 A Edwardian mahogany and satin wood sofa, with marquetry inlaid back splats, on a cream upholstered seat, on square, tapering legs and spade feet. 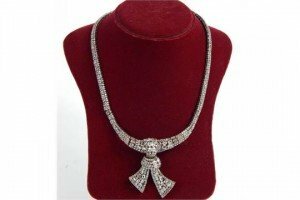 An 18ct white gold and diamond necklace, of tied knot form set with oval and brilliant cut diamonds, the knot of trembleuse form, on a snap clasp.